The first Aussie-made, allergy-friendly kids chocolate have hit the Australian market. Using pure, natural, organic and vegan ingredients, The Chocolate Yogi (www.thechocolateyogi.com.au) has pioneered a healthier alternative to mainstream chocolate for both children and adults alike. Now with the introduction of Oscar the Orangutan, you can satisfy your chocolate craving and support an amazing cause at the same time. 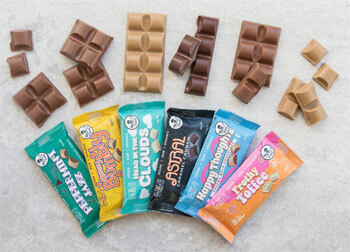 Three years ago, founders Ed Lower and Malindi Lovegrove created an award-winning Belgian-style vegan chocolate bar free from dairy, gluten, soy and refined sugar (now known as their signature -Fun Bar' range consisting of six vegan chocolate bars). The chocolate was originally marketed to health-conscious women aged 25-35, but Malindi and Ed were so amazing by the positive response they received from mums, children and teenagers, they knew they had to work on developing a kid-friendly (and big-kid friendly!) range by way of 15g animal-shaped delicious chocolate bars. 'We've had so much interest and demand in Oscar the Orangutan and are so happy that The Chocolate Yogi is now filling a big gap in the market," says Ed. 'We believe in sharing profit and contributing to causes that matter to create a better world and positive karma for all beings. And we like to have fun, so what better way than with healthy chocolate?" says Malindi. 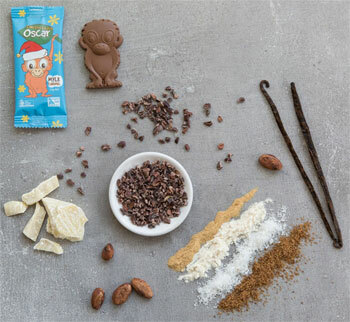 Like all products in The Chocolate Yogi's yummy range, Oscar the Orangutan is made with certified organic ingredients. What sets Oscar apart is that 5c from the sale of every bar goes directly to The Orangutan Project. Through a number of critical activities, such as fighting deforestation and orangutan rescue, rehabilitation and release programs, The Orangutan Project offers much-needed protection to the rainforest and orangutans in Indonesia. The Chocolate Yogi Oscar Whyte Chocolate - 15g bar is made from a minimum of 35% Cacao, an angelic raw vanilla powder and sweetened with organic coconut sugar for a natural sweetness that will make your heart sing. The Chocolate Yogi Oscar Mylk Caramel Christmas Ltd Edition - 15g bar has been infused with creamy mylk chocolate with swoon-worthy organic caramel essence to create a silky smooth chocolate that tastes like dessert. Certified Organic Ingredients: Coconut Sugar, Raw Cacao Butter, Raw Cacao Paste, Coconut Flour, Desiccated Coconut, Lucuma Powder, Vanilla Bean Powder, Caramel Extract. Cacao solids 41% min. Question: Can you talk about your original motivation to create the Fun Bar? Malindi Lovegrove: TCY had been out in the market for 18 months and we were looking for how we could innovate and stand out from the crowd. We noticed that all the bars out there were pretty serious, lots of browns and greens, so we felt like it was time for some fun disruption! ;-) We thought about what we would personally like to see out there, and we realised that we wanted something that made us happy, and that reminded us of being a kid. We also wanted to create an aspirational bar that would communicate an uplifting message and convey our intention as a company, which was to create chocolate that changes the world. We decided that we wanted to truly live that message, not only by making ethical vegan chocolate, but also by contributing to charity. We approached Sea Shepherd about raising money for them through our vegan chocolate, and they were really happy to partner up. We decided to donate 10 cents from every bar to them, as profit is a very changeable thing when you are starting out as a business, and that way it would be totally transparent, our customers would know how much they were contributing every time they purchased. The Fun Range was born. Question: What inspired the creation of The Chocolate Yogi? Malindi Lovegrove: About 5 years ago Ed and I went on a diet where we excluded all the main allergens for a couple of weeks. We discovered that we both had an allergy to dairy and that gluten made me very ill. So we suddenly had to make some drastic changes, the biggest one for me was letting go of dairy milk chocolate. I was deeply in love with milk chocolate and not a fan of dark chocolate. Yet at the same time I was learning about nutrition and about the negative effects of white sugar, dairy and other processed ingredients. I knew I had to let it go. So I started experimenting at home, making my own version of mylk chocolate, using coconut, lucuma, coconut sugar and other ingredients. The chocolate tasted pretty good, I was determined to make it taste as much like the milk chocolate I remembered as possible. 2 years later we were at a Prosperity seminar with multi-millionaire Jeffrey Slayter and he encouraged us to turn my passion in to a business. We decided to go for it and managed to get investment that very weekend. Question: How long has The Chocolate Yogi been in the works? Malindi Lovegrove: We got investment and started full time in July 2014, so we have been going for just over 3 years. We released our first product range in October 2014, and released the Fun Range in July 2016. Oscar the Orangutan was released in September 2017. Question: Can you talk about the allergies The Chocolate Yogi avoids? 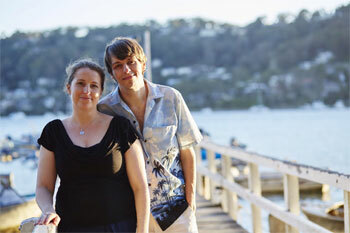 Malindi Lovegrove: We have worked really hard to make our chocolate from organic wholefoods, but to also be delicious. We exclude dairy, gluten, soy, nuts and all the other main allergens. We know what it feels like to not be able to eat chocolate when you have an allergy, so we wanted to make it accessible to as many people as possible. It can be hard, especially for kids with allergies, to not be able to have a treat when all their friends are eating chocolate and other sweets, they can feel left out. That is why we wanted to make our chocolate look as fun and 'normal' as possible, so they could eat healthy chocolate and still keep their street cred. Question: Why is The Chocolate Yogi a healthier alternative to mainstream chocolate? Malindi Lovegrove: The first thing is that our ingredients are all certified organic. Cacao is one of the most heavily sprayed crops in the world, so it is really important that you have organic chocolate. Secondly, we use raw cacao and keep our chocolate below 50 degrees celsius during production, this ensures that our chocolate delivers 10x more antioxidants than standard chocolate. We are different to most raw chocolate companies in that we use whole cacao nibs, not processed cacao powder, so our chocolate is made primarily from wholefoods (apart from the cacao butter, which is cold pressed from the cacao nibs). Because we use coconut flour and dessicated coconut, our chocolate is actually quite high in fibre (coconut flour is 38.5% fibre, and is the highest fibre flour on the planet, dessicated is 20% fibre) which can help fight type 2 diabetes and cardiovascular disease. We use coconut sugar to sweeten our chocolate, which is an unprocessed low GI sugar. We do not use any additives or preservatives, just natural whole ingredients that our body recognises and can easily digest. Question: Why was it important for you to support The Orangutan Project? Malindi Lovegrove: We were on the lookout for charities to support. We wanted to support charities that were taking direct action and having a major impact on the issue they were solving, and charities where we knew the majority of our donation would find its way to the real cause. We came across The Orangutan Project at a vegan festival. They told us they had just purchased 100,000 hectares of rainforest land in Indonesia with $30,000 AUD. They are now protecting that habitat and all the animals that live there, including the orangutans. We were inspired, we said to them 'we could raise 30K for you, why don't we make an orangutan bar?'. 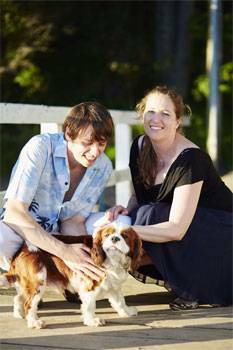 They were really excited about the idea, so we started actioning it immediately and little Oscar was born. We love him and what he stands for, a reminder that we can all work together to both enjoy and protect our amazing world. Question: Which is your favourite of the products? Malindi Lovegrove: That is a very difficult question! At the moment, we are so in love with Oscar, especially the limited edition Caramel flavour we recently released for Christmas. But for me, Hunny Bumbly will always have a special place in my heart, as well as Peppermint Jazz, because they remind me of my childhood favourites. Ed is totally mad over Astral. Malindi Lovegrove: We are just about to launch international shipping for our online store. We are also releasing some limited edition Christmas Hampers and are working on a solution to provide year-round melt-free chocolate delivery! We are doing a crowd-funding campaign on Kickstarter in a couple of weeks which will help us to raise capital to purchase compostable packaging. We are really determined to be as eco friendly as is possible, but there are some costs involved in the change-over. We figured we might as well sell more chocolate, donate more to our amazing charity partners, while raising the funds to have a more sustainable product. We are also starting R and D on some new products, so watch this space!